Get ready! Prepare the way of the Lord! As we know that Advent means coming, and that Christ is coming to us, we are reminded once more to patiently wait and persevere in our waiting. We know it is not an easy task, and on our own efforts alone we will not be able to do it. That’s why in Advent, we need to pray more fervently and avail of the sacraments eagerly and as often as possible that we may receive God’s grace of patience and perseverance. We have to follow the example of Simeon and Anna and we will certainly be rewarded with the joy of salvation! I know many of you have already put up your Christmas tree and Christmas decorations right after Thanksgiving. That is not bad, but it would be better if you include putting up even a small Advent wreath where every Sunday or Saturday night you and your family could gather together and light one of its candles and say your prayers. 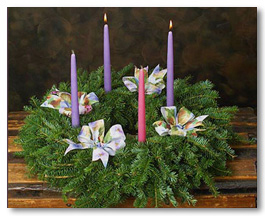 You can also share reflections on each other’s experiences while spiritually preparing during this Advent. I am sure this would help us and our families experience more meaningfully our Christmas celebration!